Update: Who will be the White House web designer? SimpleScott. SimpleScott designed Barack Obama’s website, so here’s to SimpleScott for a gorgeous design. I am the creative director of New Media for Obama for America. The team consisted of many people in house as well as many volunteers. Project leads were myself and John Slabyk. We are maintaining site and brand in-house. Sol Sender designed the logo before I joined the campaign. How did I find out SimpleScott was involved? Just check out Obama’s main style sheet. SimpleScott uses CSSEdit, a great program for Mac CSS web design. Did you notice there are two authors for Version 3? If you’re like me, you want to know who this Walker Hamilton fella is that is referenced in Version 3 of the CSS. I architected and implemented the deployment mechanisms and technologies for the campaign’s various web properties. I implemented various applications to improve some processes, automate others, and facilitate instate/headquarters communications for departments within the campaign. Other duties included general maintenance, day to day content administration, and feature planning and development for the social network tied into the site. 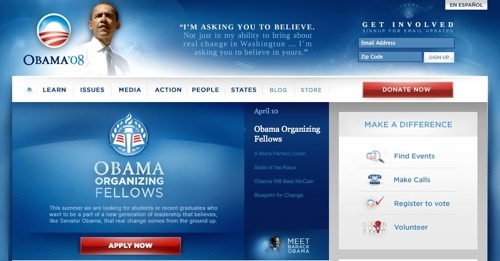 Sender, LLC developed the Obama ’08 logo. 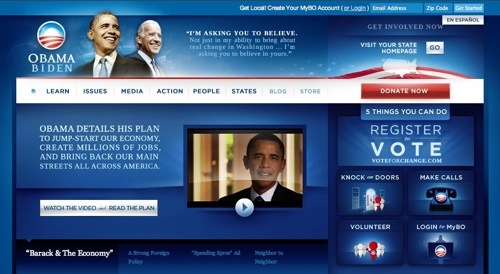 Sender designed the original mark, but the site is developed and maintained in-house by the campaign’s web team. Sender was involved *only* with the development of the “sunrise” mark, and had no role whatsoever in the design, development, or maintenance of barackobama.com. Do you like the design, or not? What aspects work best for you? Drop a line below. Which design do you like? I prefer the lighter, more optimistic “Primary Obama” website, not the Obama/Biden serious, solumn “General Election Obama” site. What do you think?